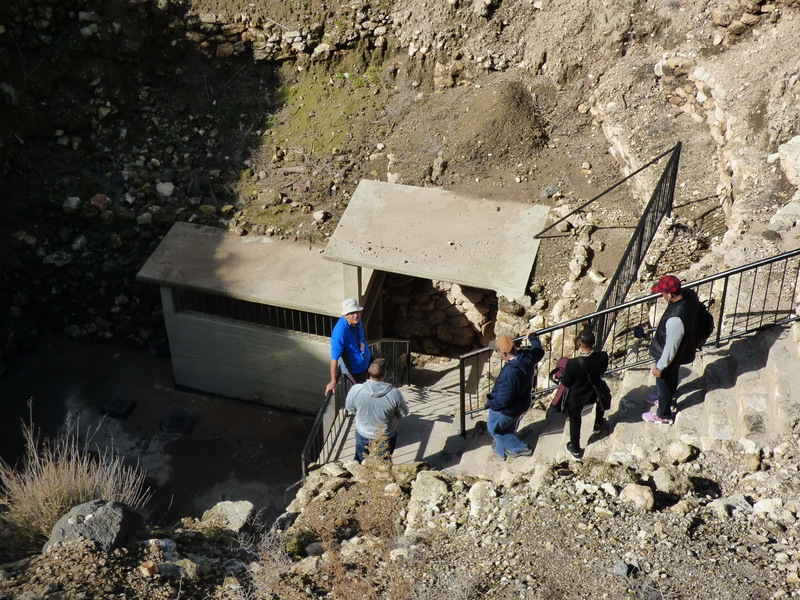 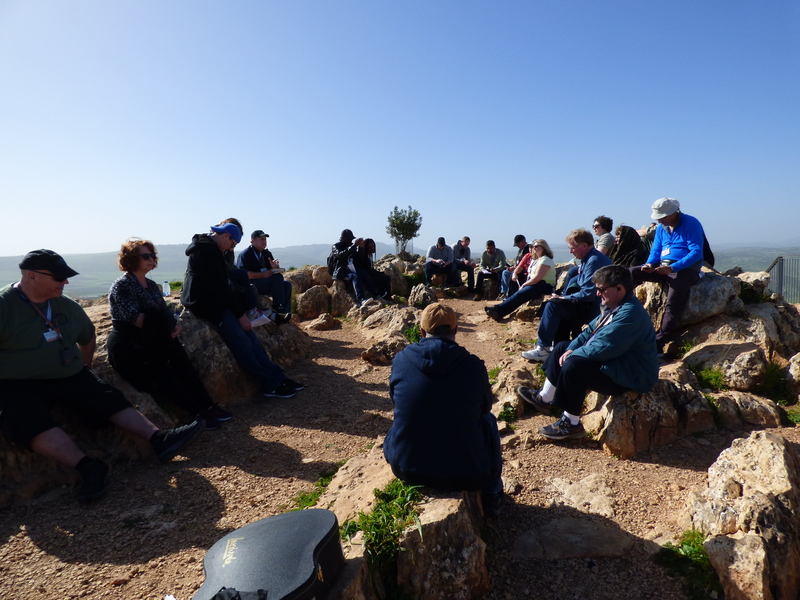 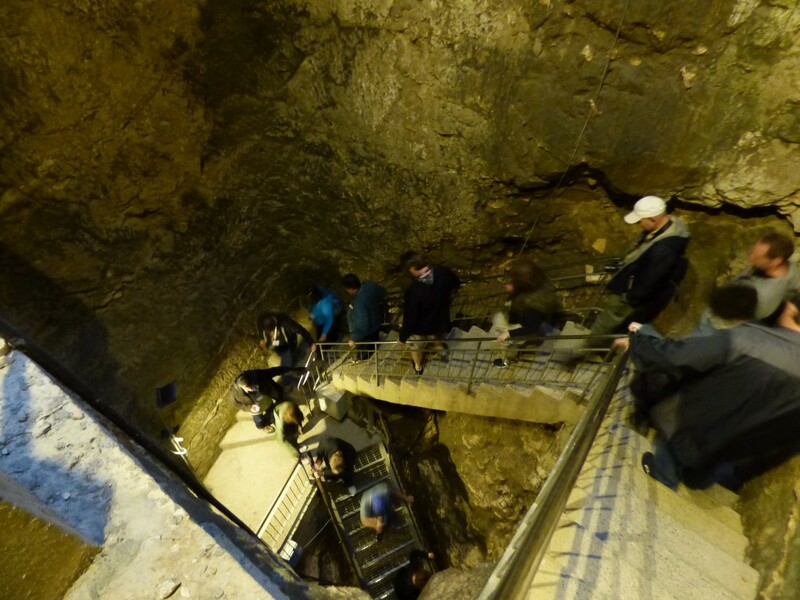 Our guide commented that most old cave tombs in Israel (like the one Jesus was buried in) have their round sealing stones stolen (to be used as building materials). 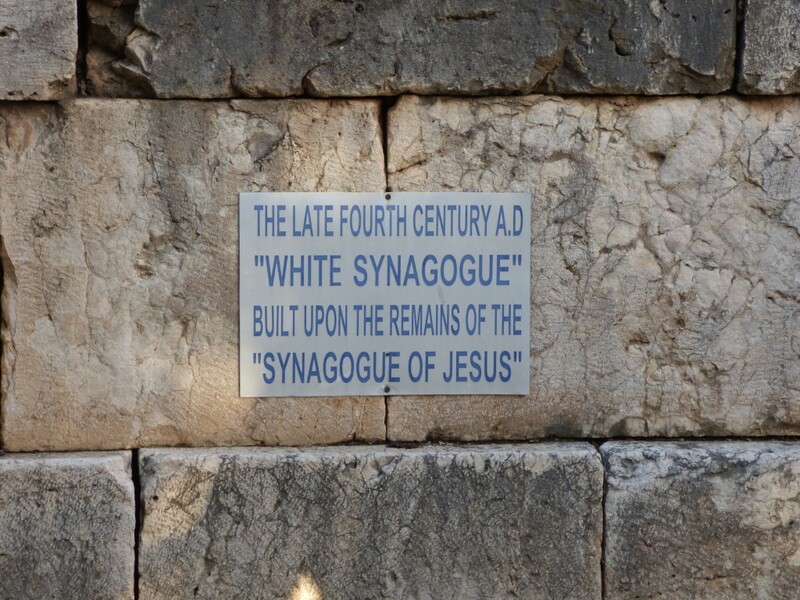 We drove past an intact example, but were unable to stop. 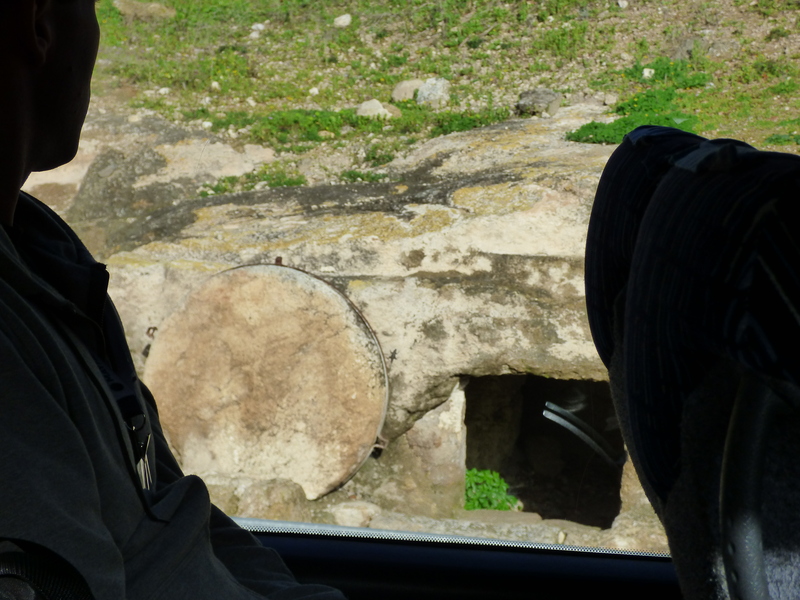 That’s why this picture is taken from inside the bus. 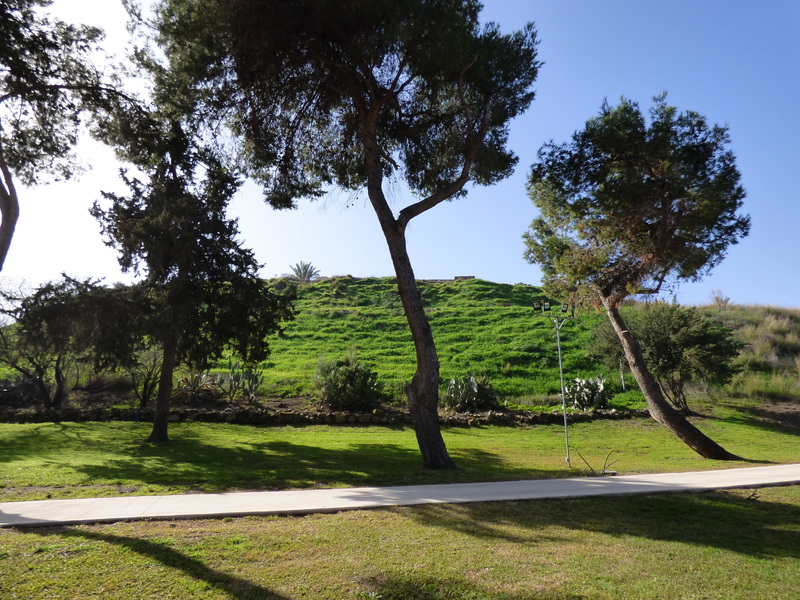 At the base of the tel (hill/mound) starting our walk up to the ruins of the city. 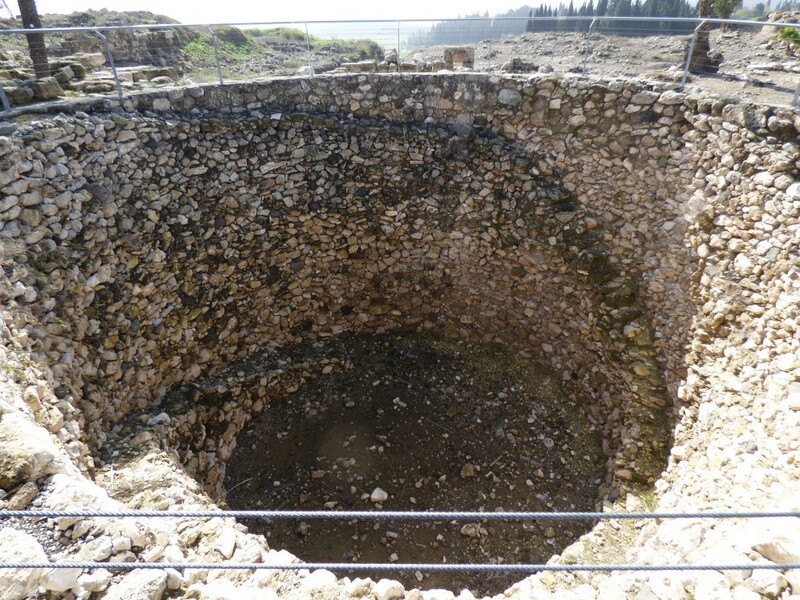 This looks like a well or cistern, but it is actually a grain silo. 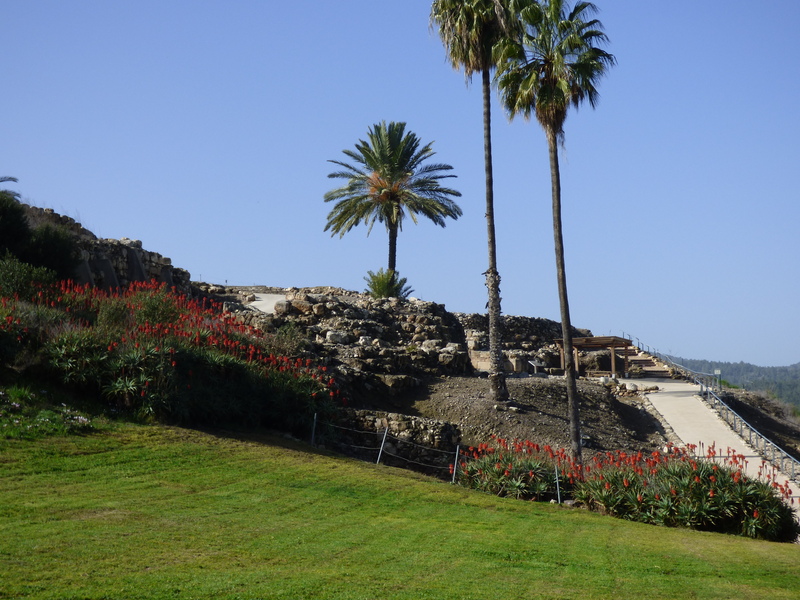 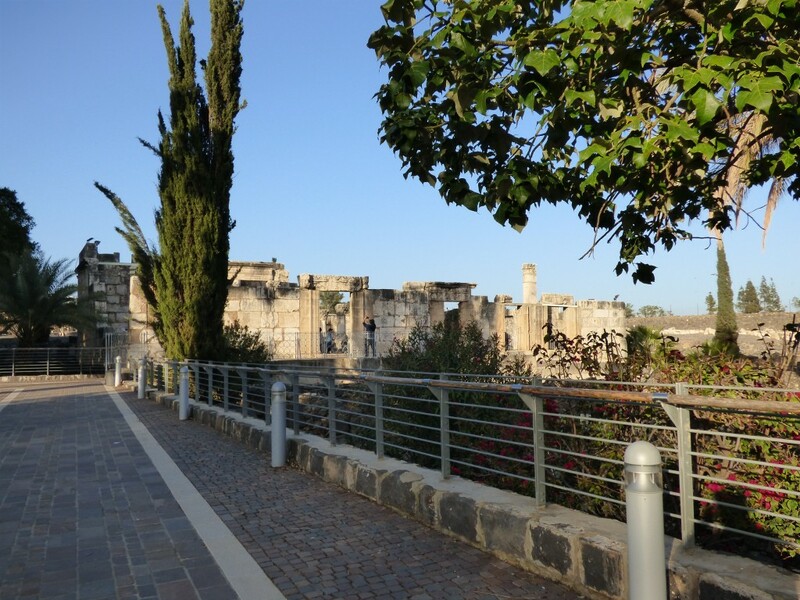 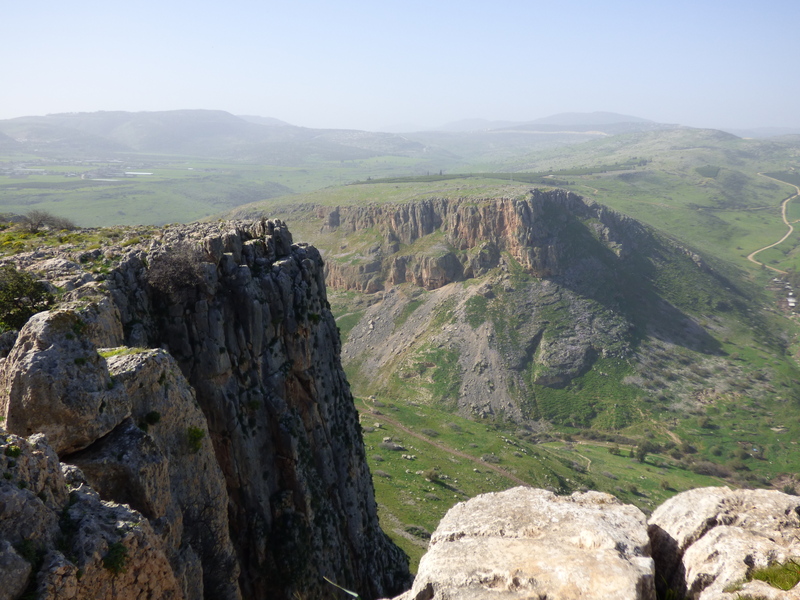 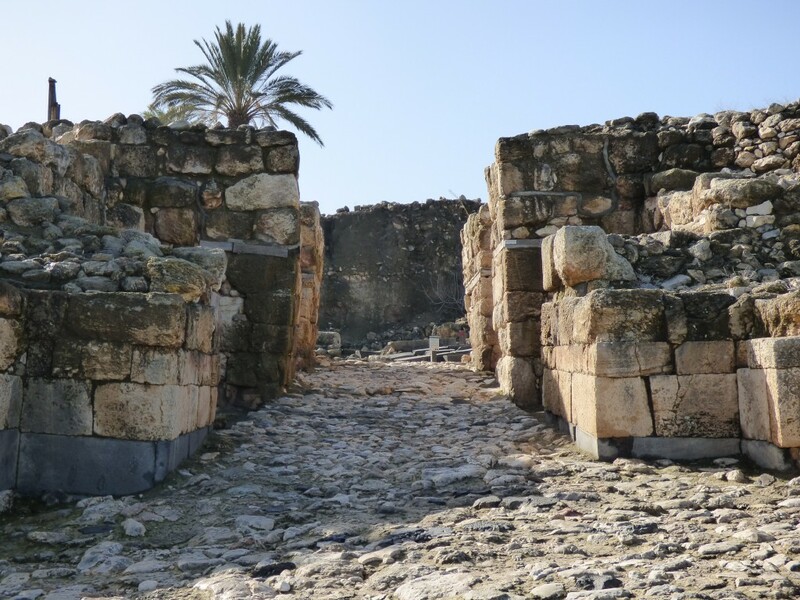 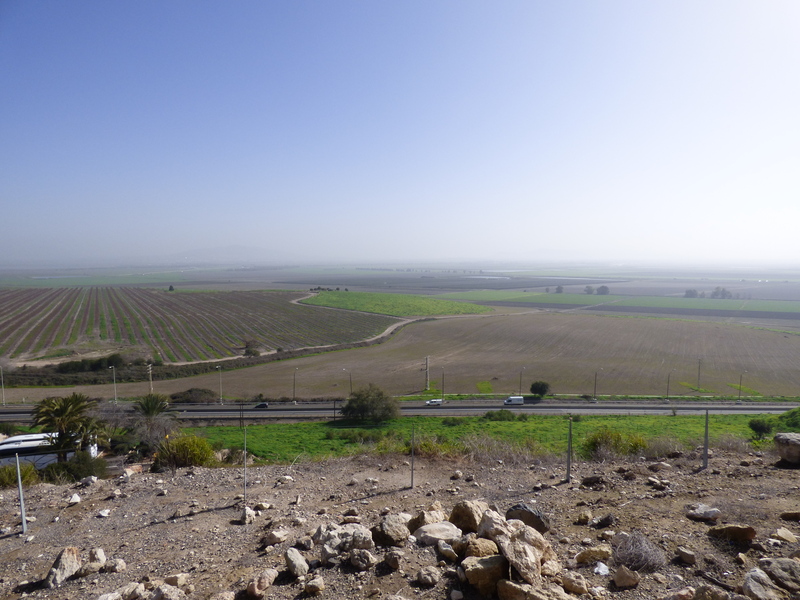 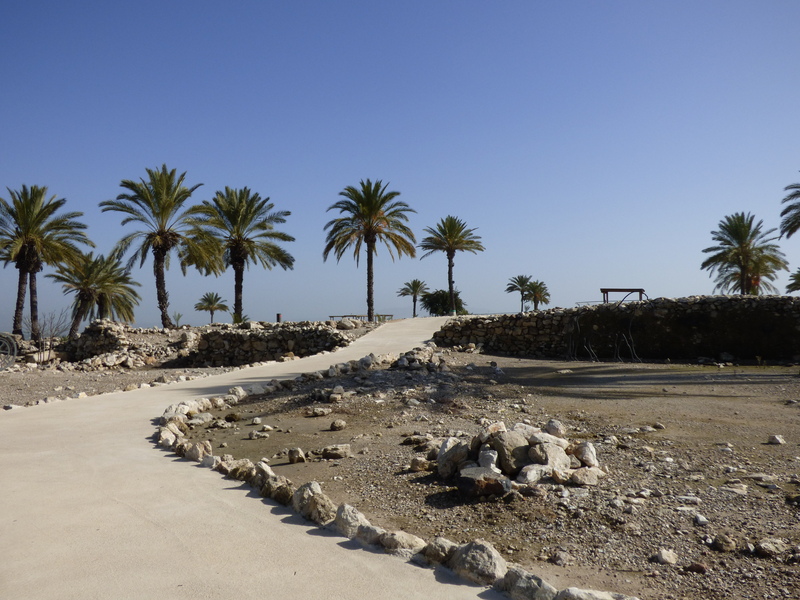 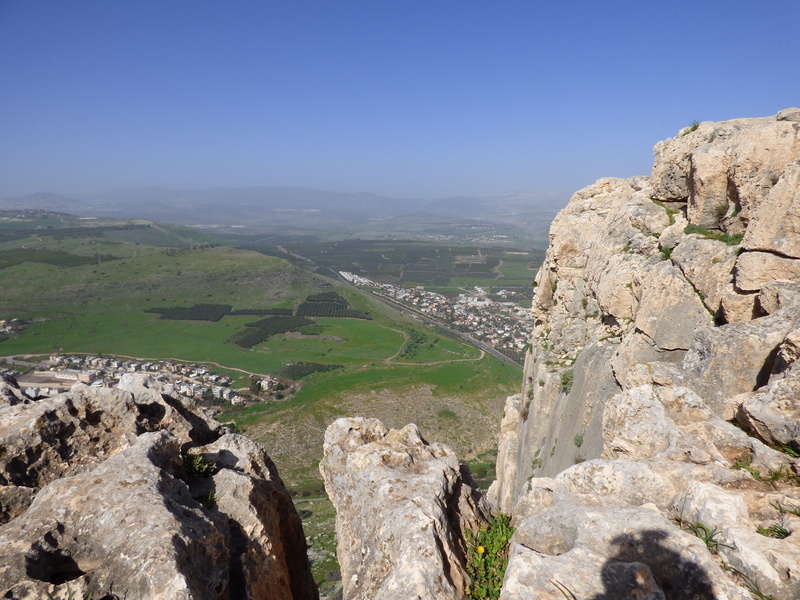 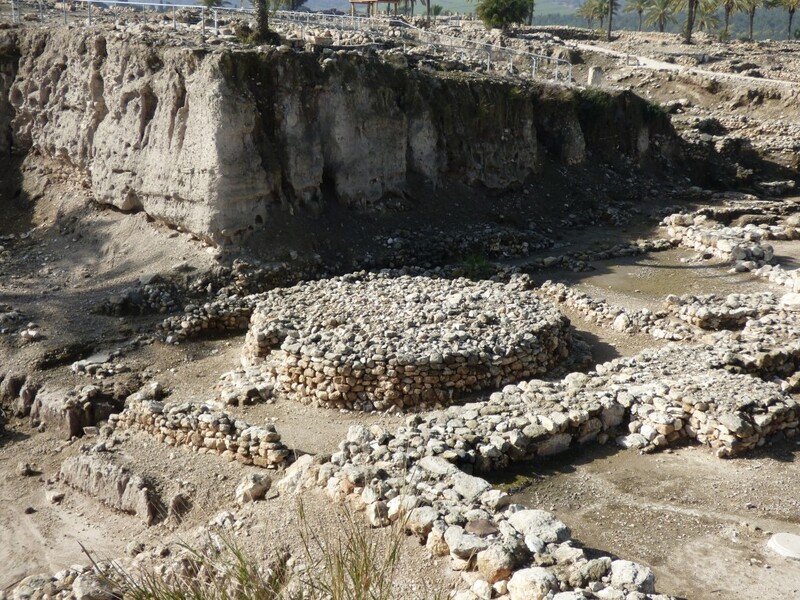 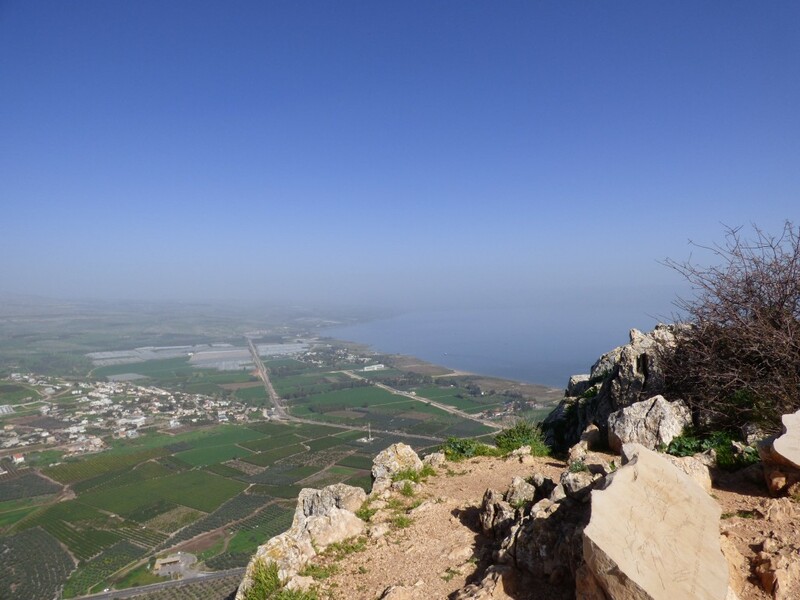 Megiddo was a military city where many horses and chariots were kept. 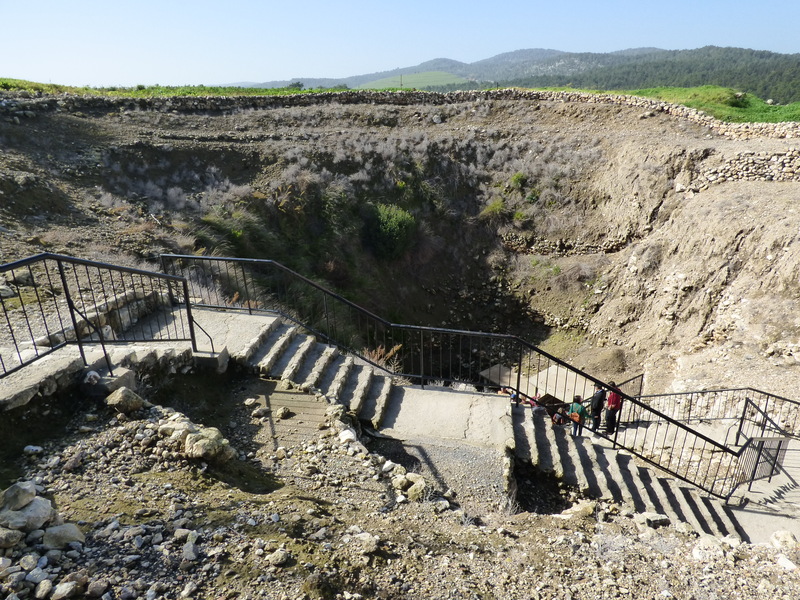 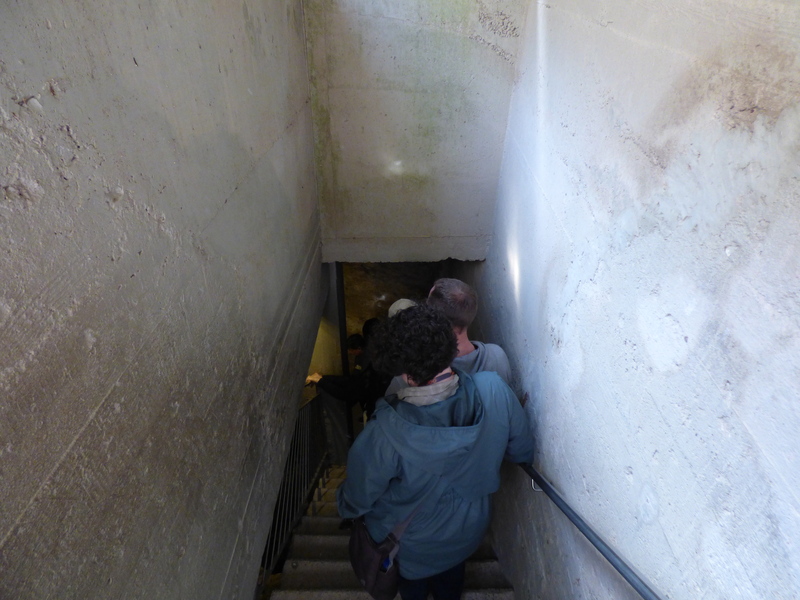 These stairs lead down to a tunnel that provided water from a source outside the city. 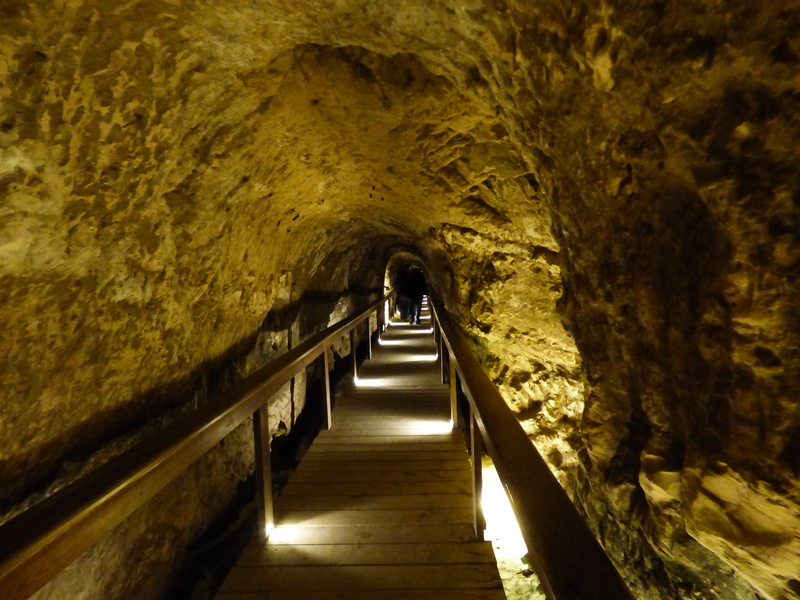 Walking through the tunnel (you can’t see it but there is water under the “bridge” where we are walking. 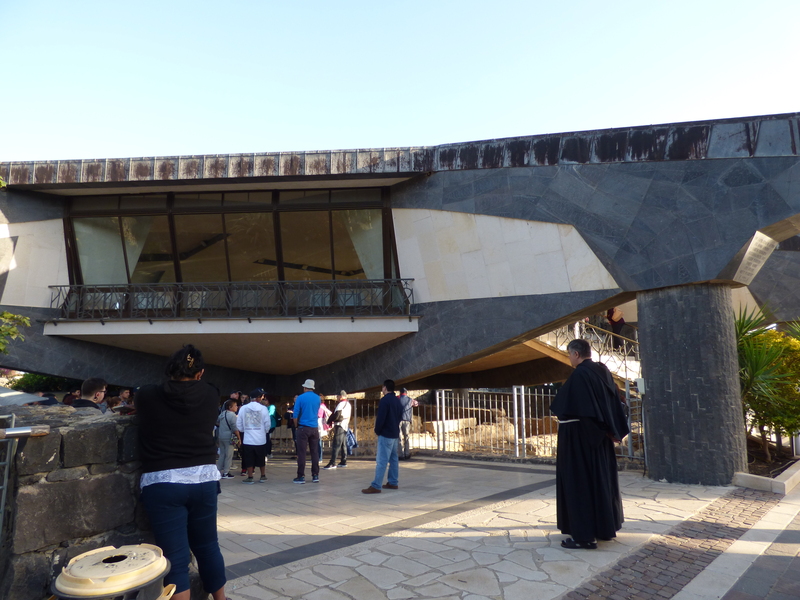 A modern catholic church literally built “over” the traditional site of Peter’s house in Capernaum. 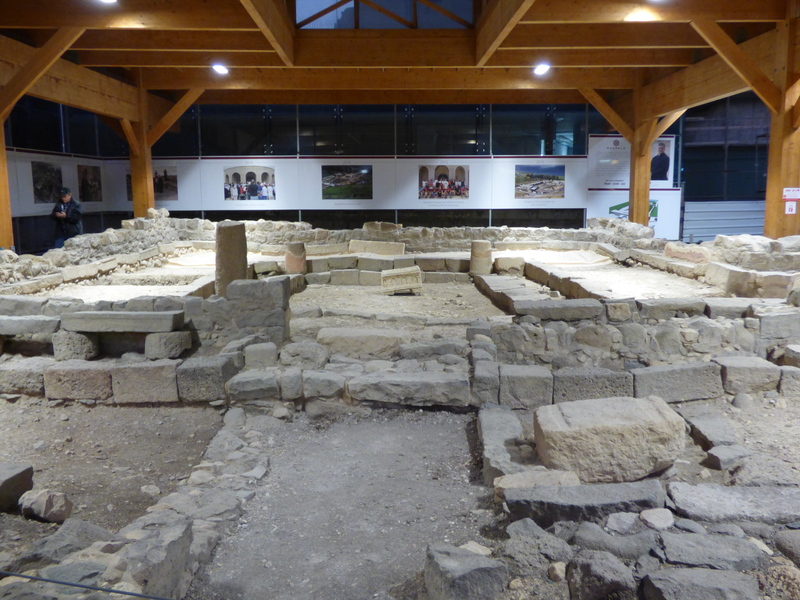 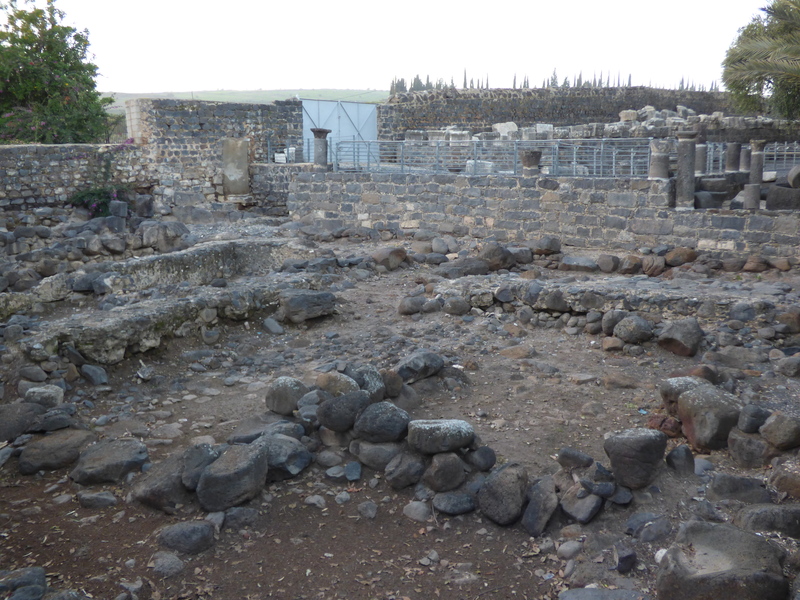 Multiple churches were built on the traditional site of Peter’s house. 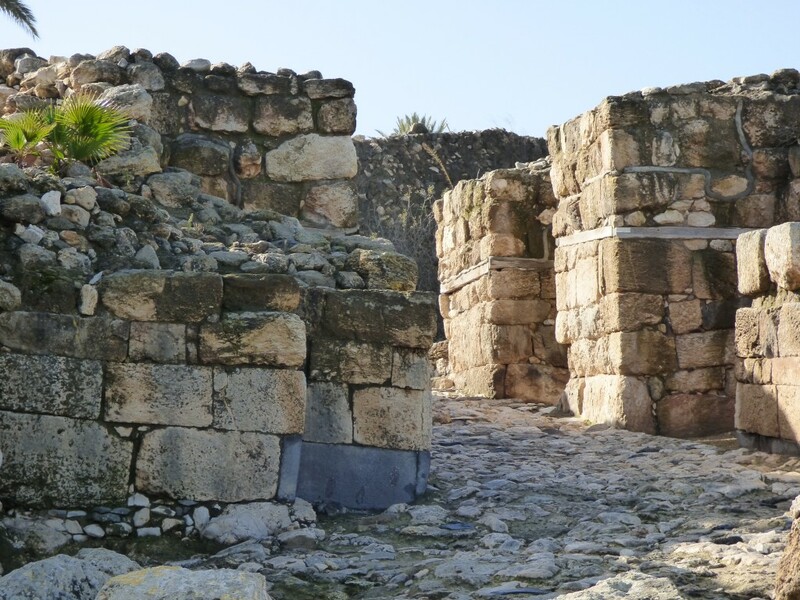 The actual house is the square walls at the center. 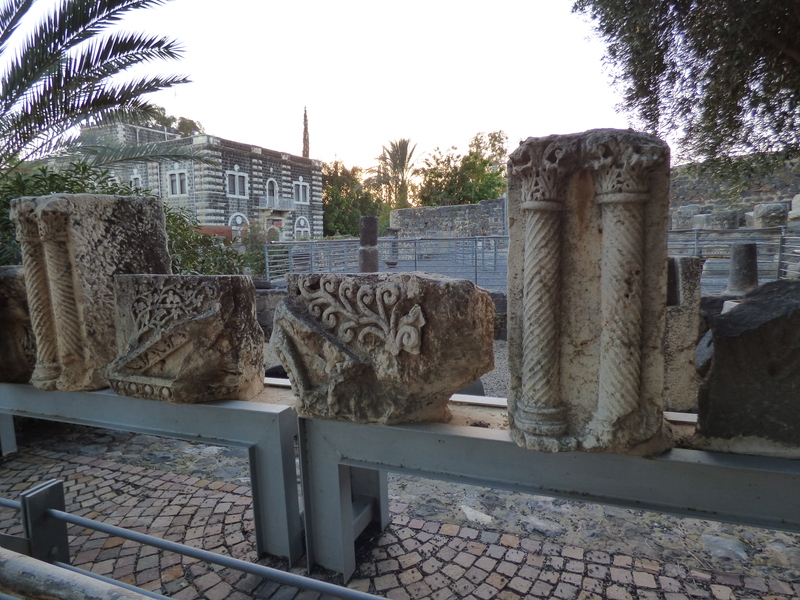 The “white” synagogue dates from the 4th century AD, but is thought to be built on the foundation of an earlier (possibly 1st century) synagogue. 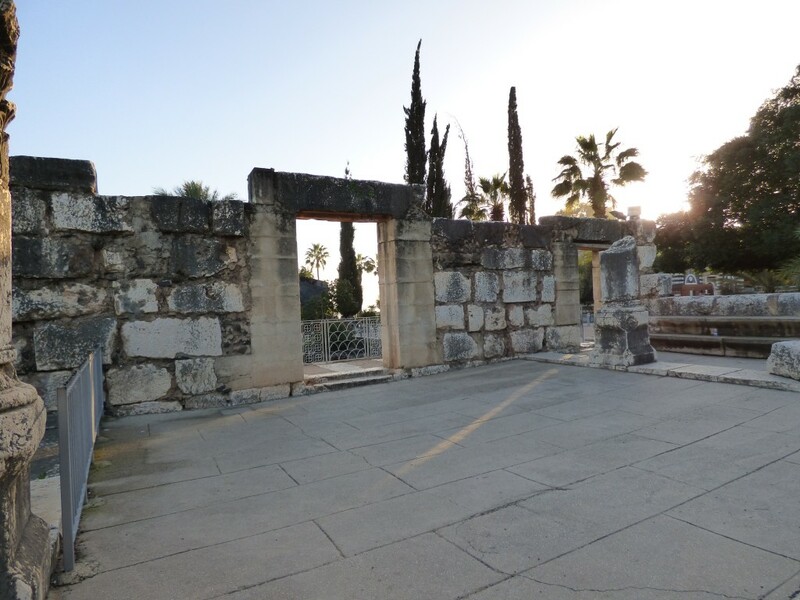 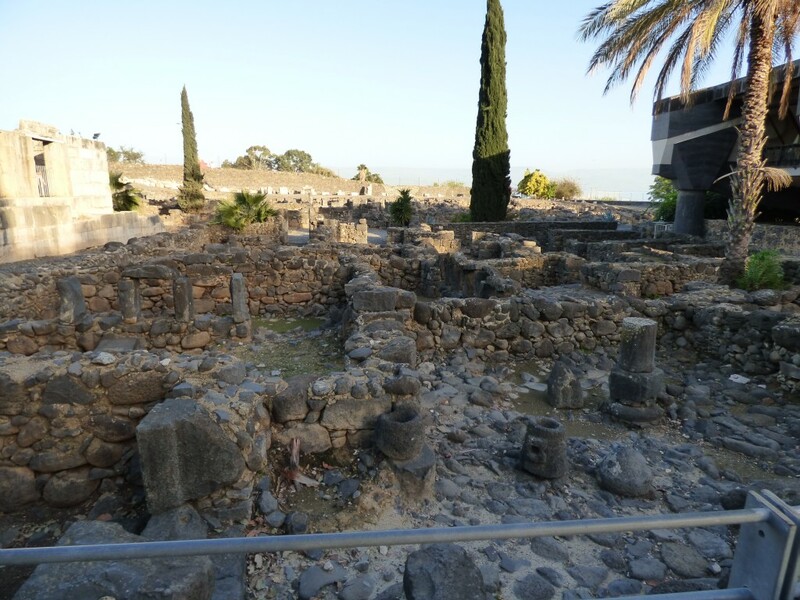 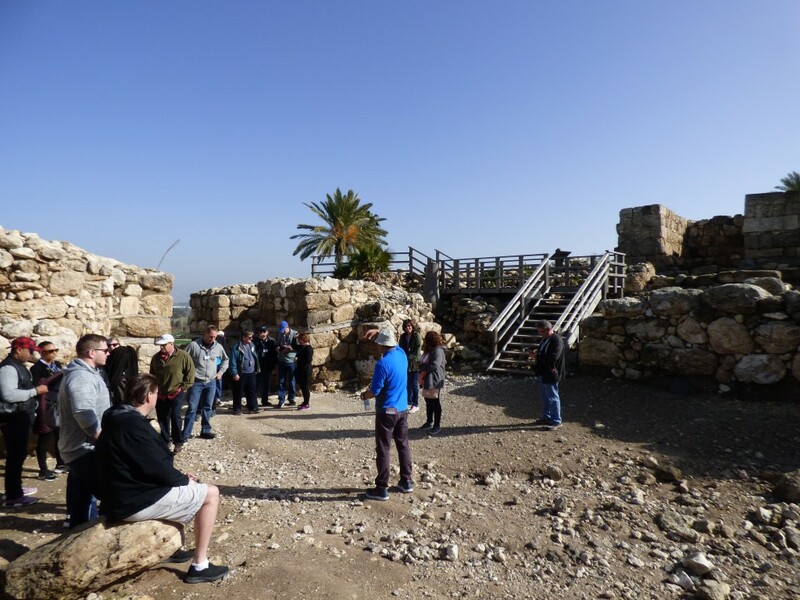 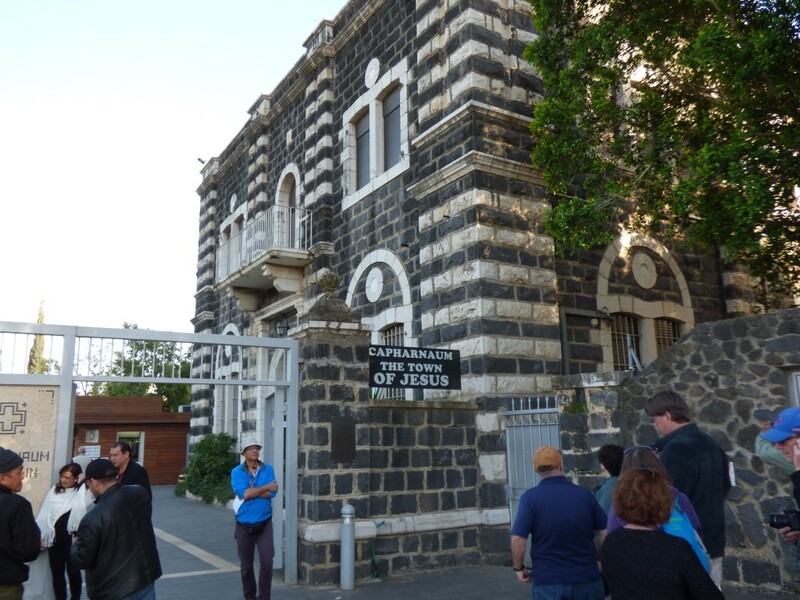 Jesus activity at the Capernaum synagogue is documented multiple times in the Gospel accounts. 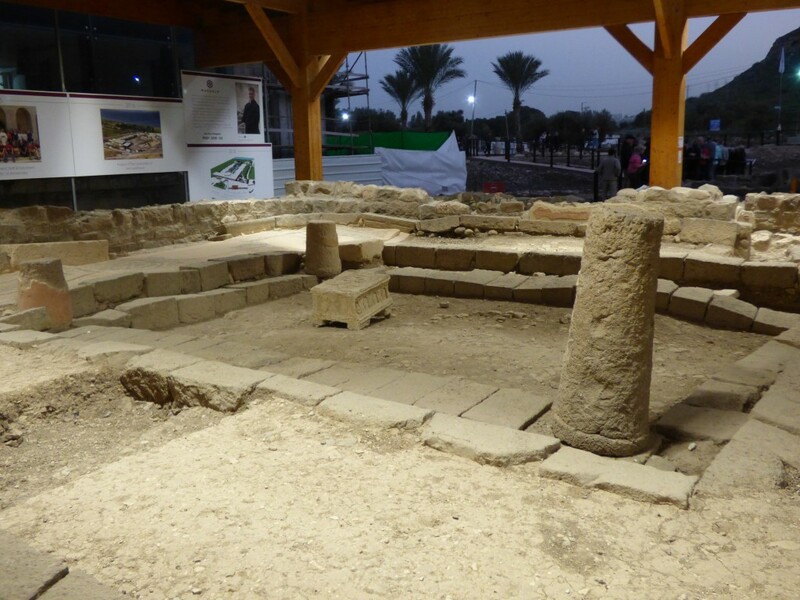 Here you can clearly see how the “white” synagogue sits on the foundation (black stone) of an earlier structure. 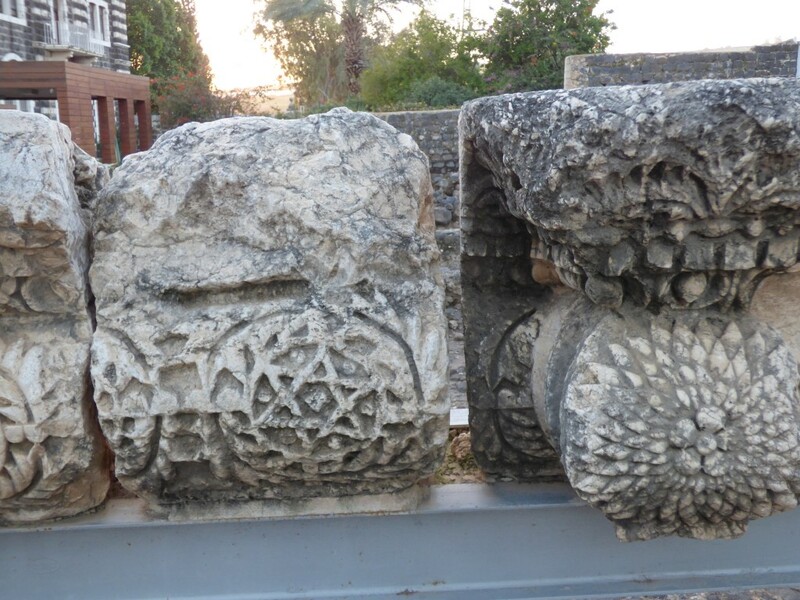 Additional ornamental pieces excavated from the white synagogue. 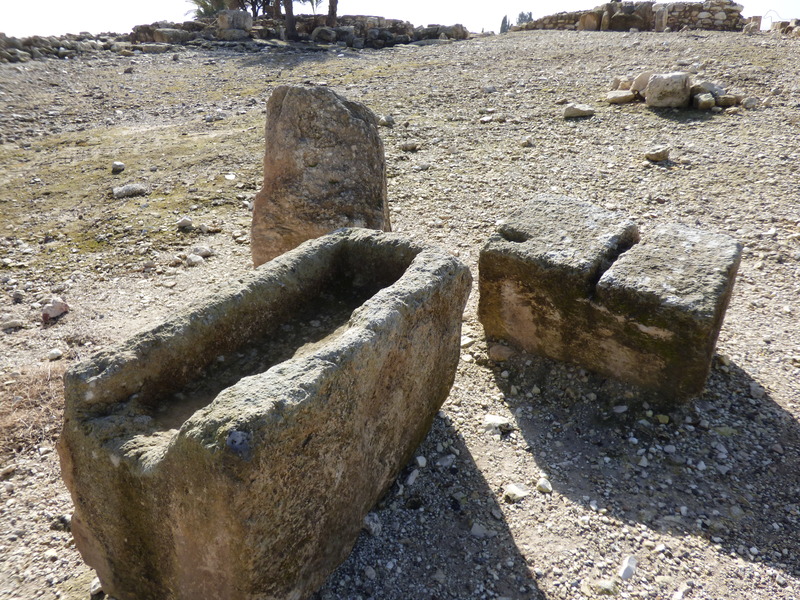 This was probably the most interesting site we’ve visited so far. 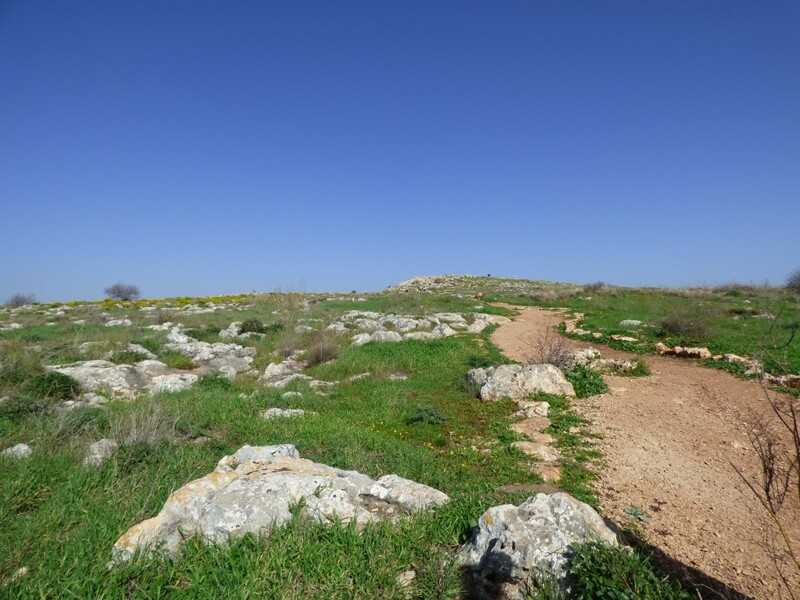 So many first century ruins no longer exist in situ (or have other structures – usually churches – built on top of them). 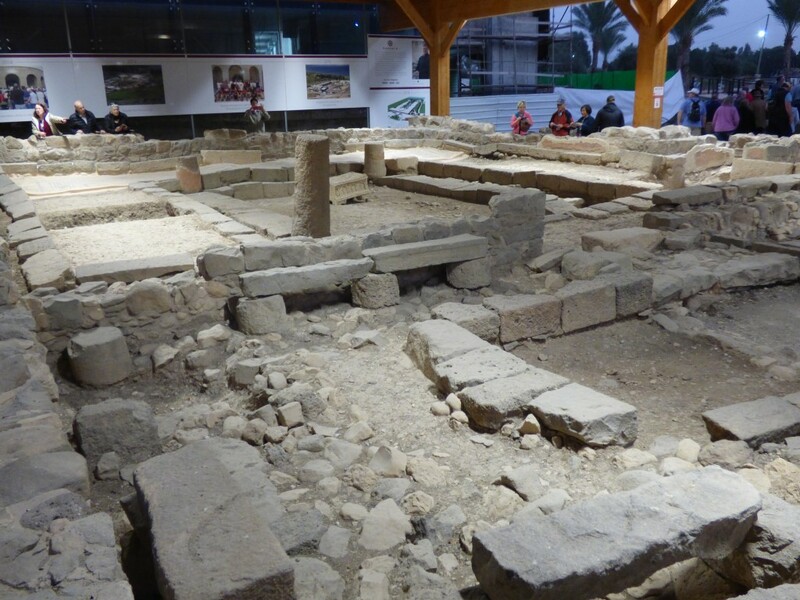 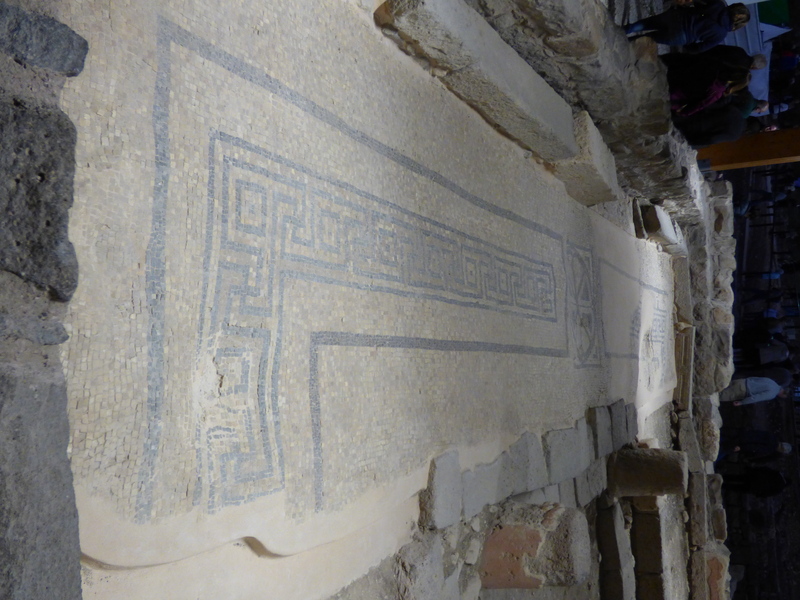 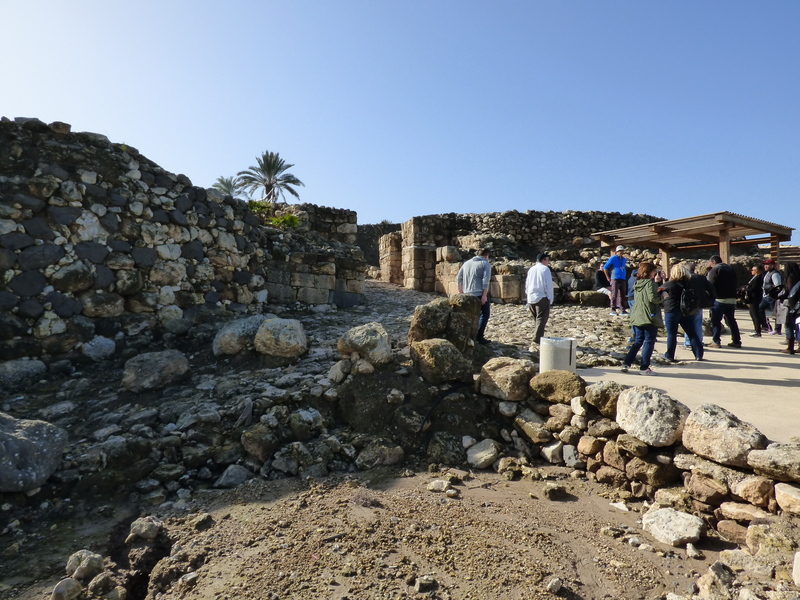 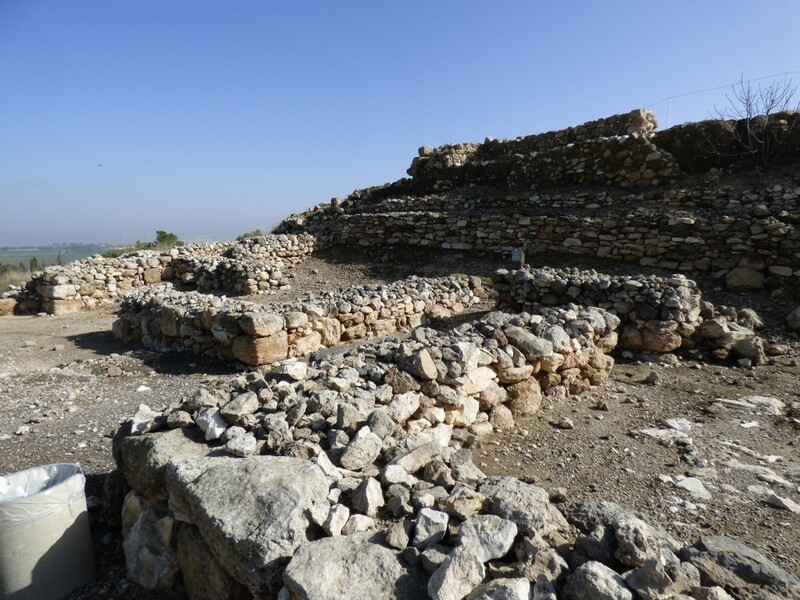 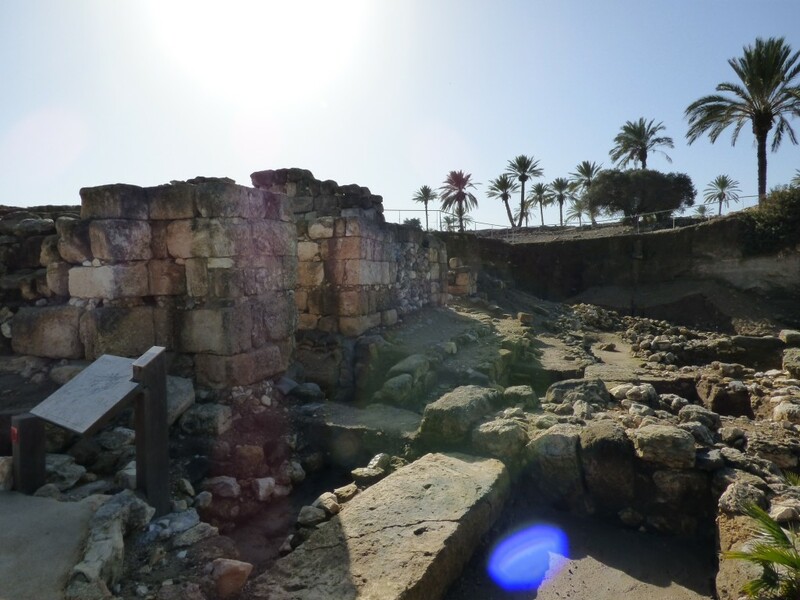 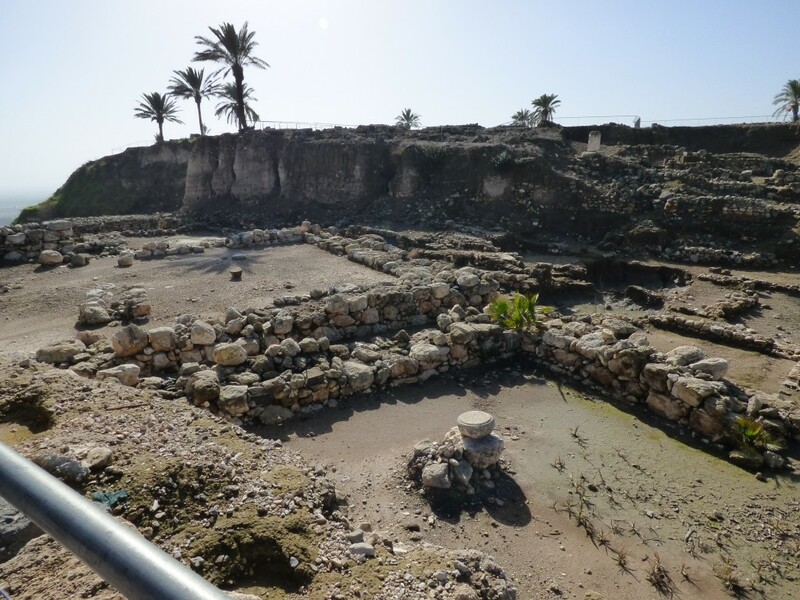 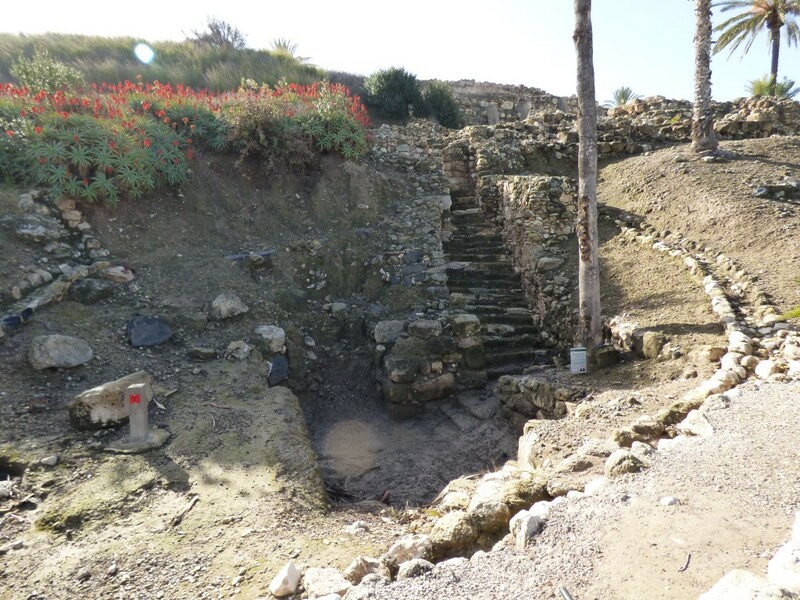 In 2009, archeologists unearthed the ruins of this first century synagogue in Magdala. 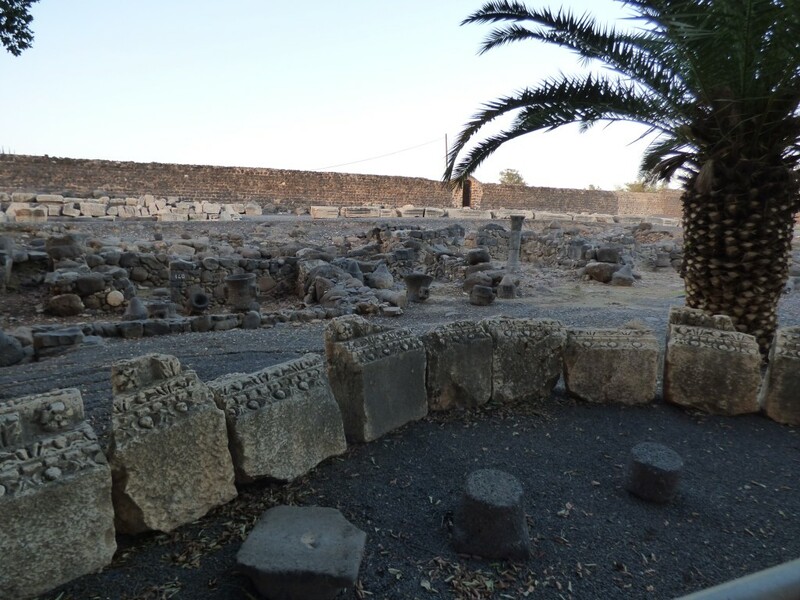 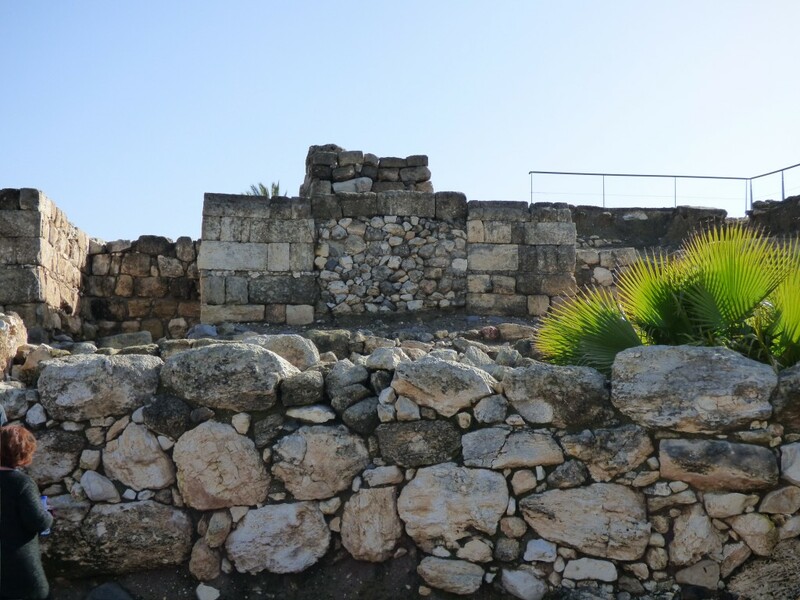 While not mentioned in the New Testament, because of it’s proximity to Capernaum (Jesus’ home base in Galiee) and the fact that one of his closest followers was from this village (Mary Magdalene) it is VERY LIKELY that Jesus taught in this synagogue. 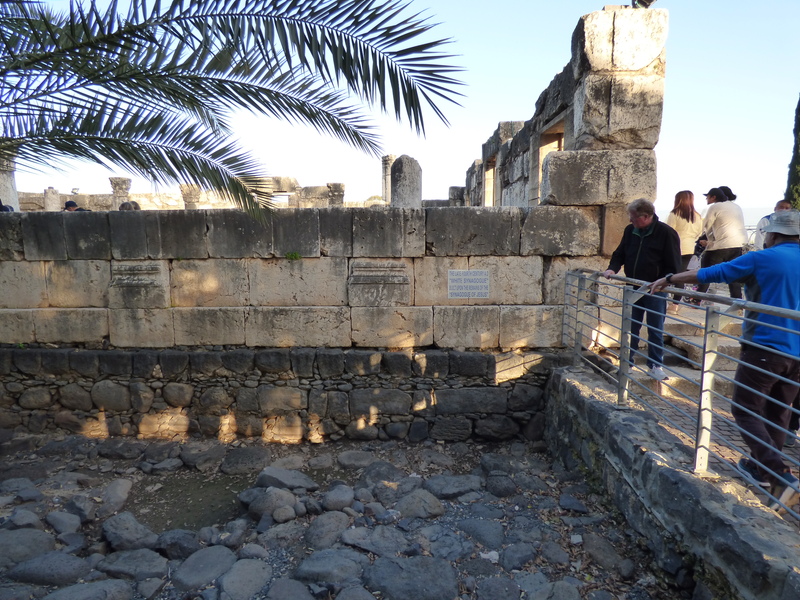 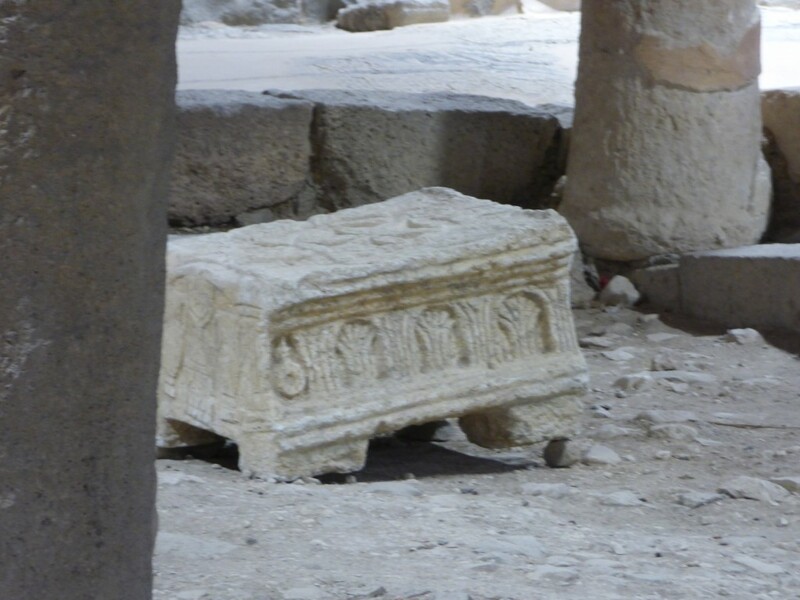 Central stone in the 1st century synagogue, likely used as a table to roll out the Torah scroll when it was read. 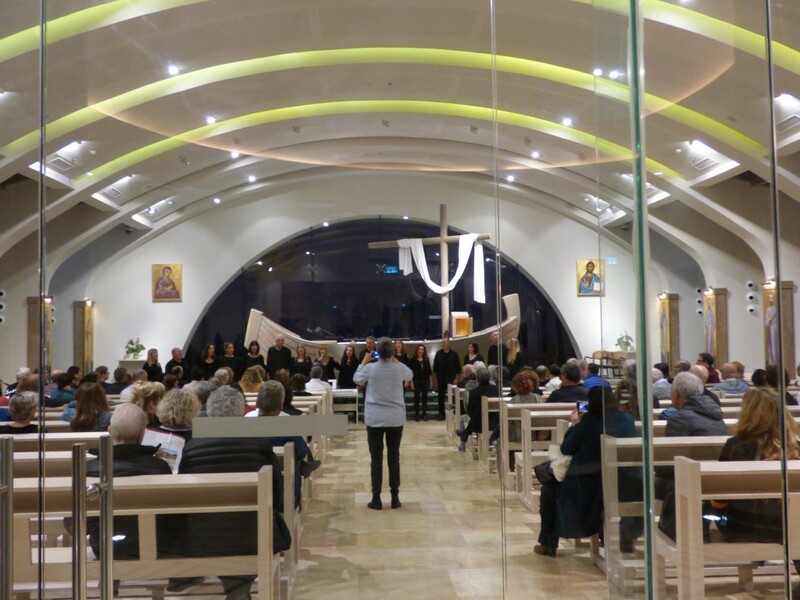 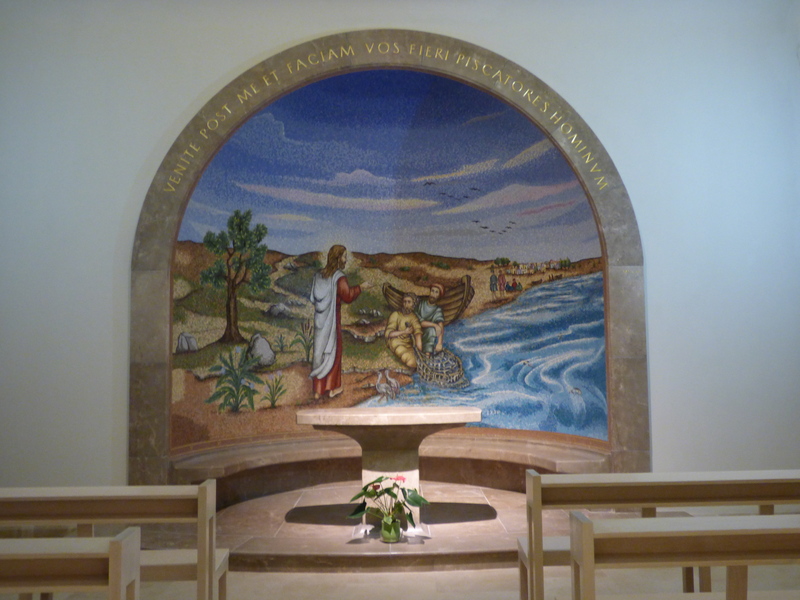 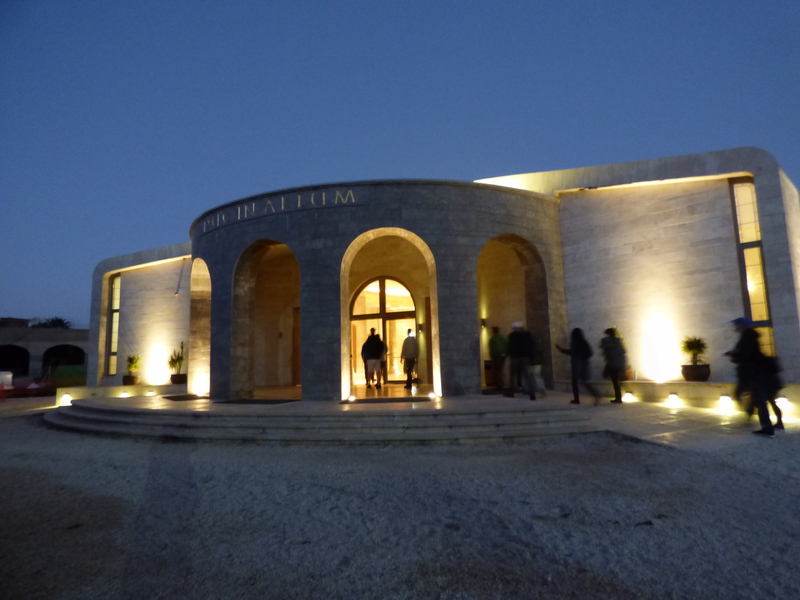 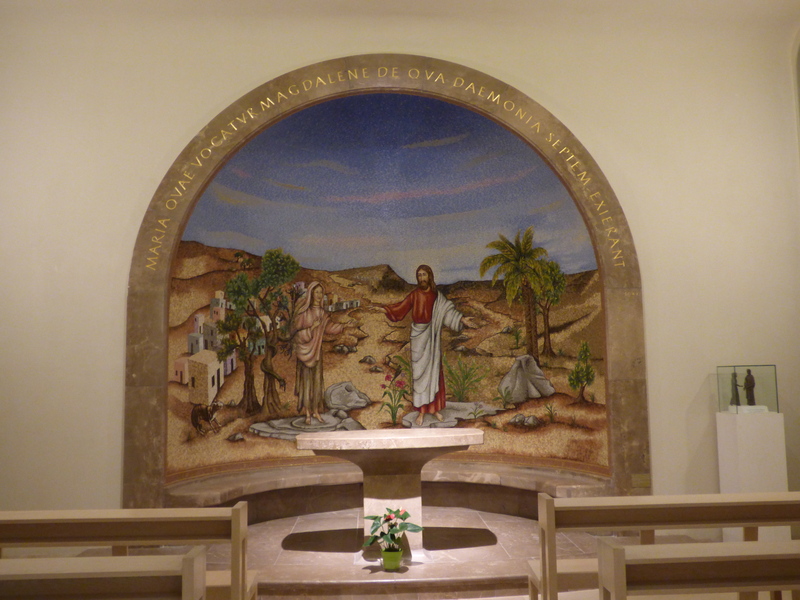 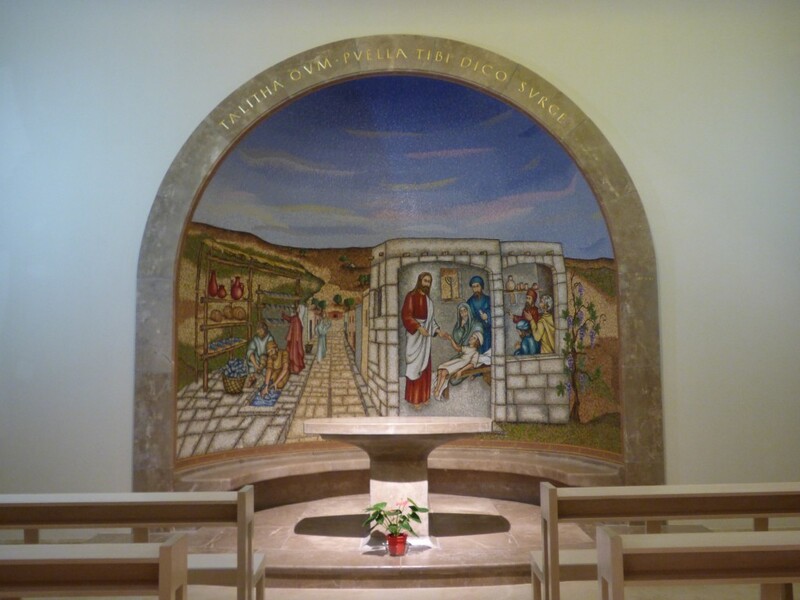 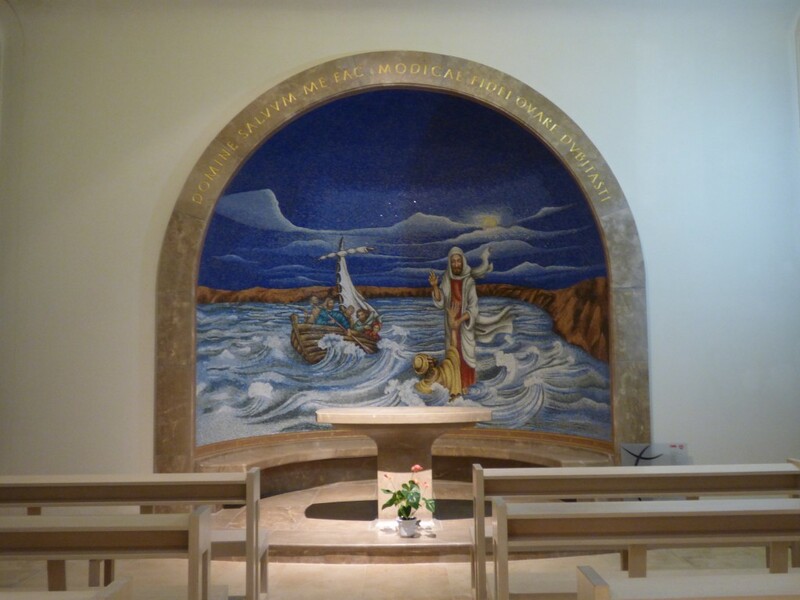 A modern church built in Magdala by the Roman Catholic church, but available for use by all denominations. 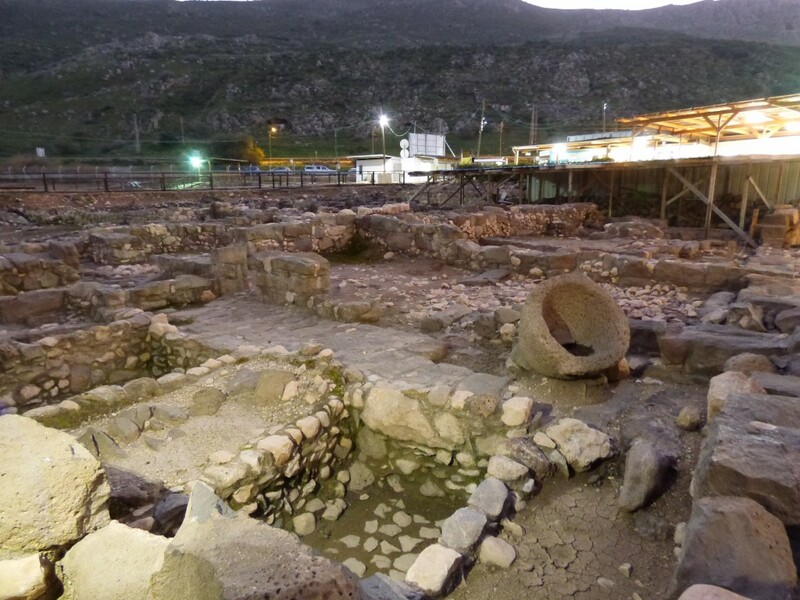 It specifically honors women from the New Testament. 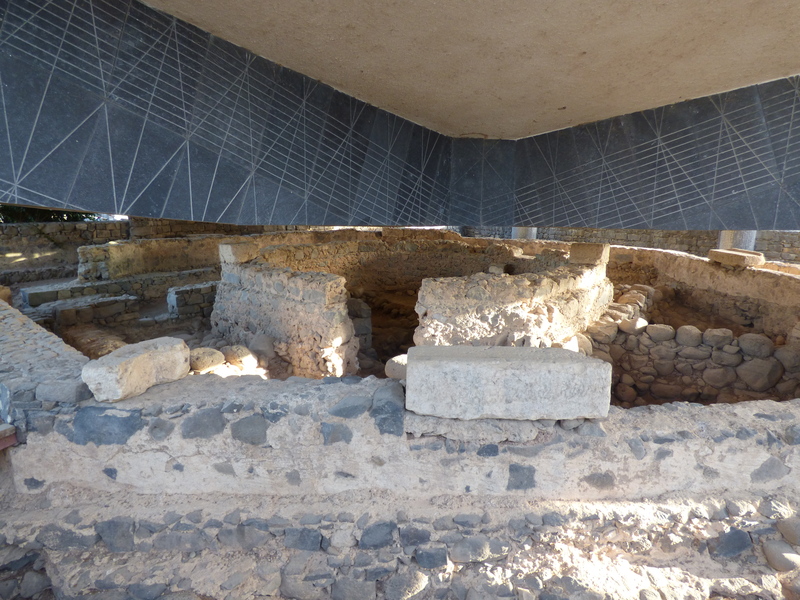 This prayer chapel (on the basement level) has been repaved with 1st century stones excavated from the streets of Magdala. 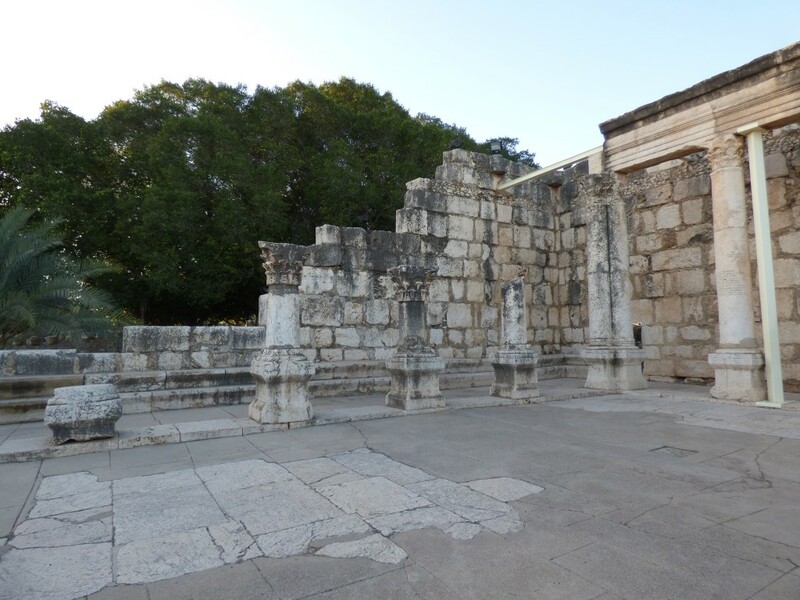 It is set up like a synagogue (stone benches along the walls, six pillars, and a space in the front for the Torah scroll. 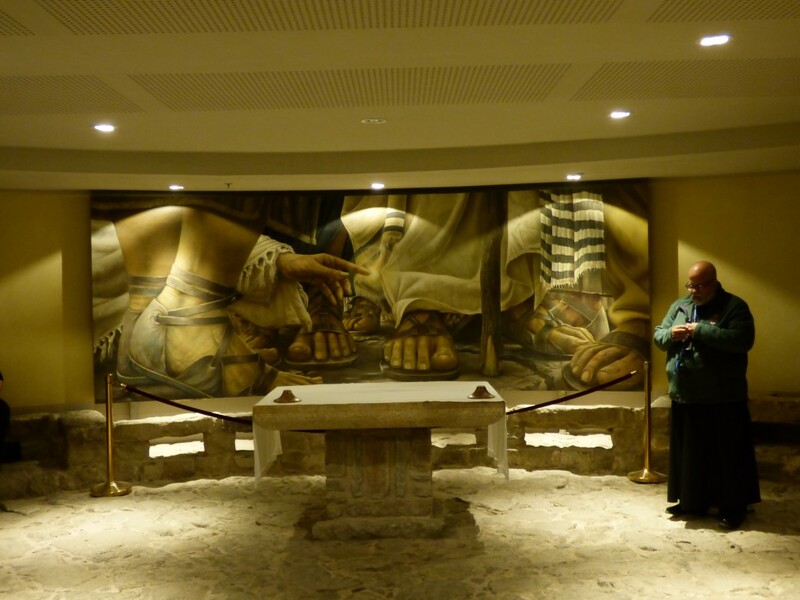 The painting depicts the healing of a woman afflicted with a hemorrhage when she touched Jesus’ robe. 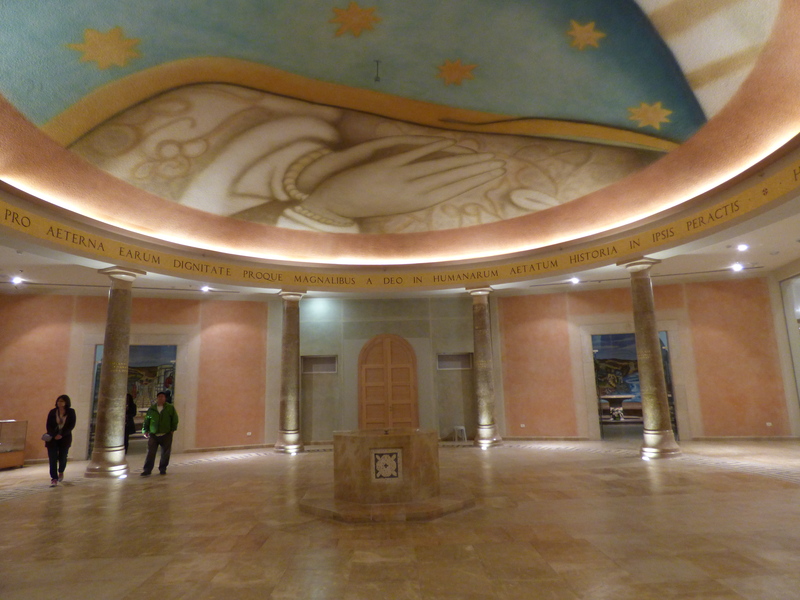 The lobby area outside the main sanctuary.